Our research focuses on the structure of a research community of Russian scientists involved in network studies, which is studied by means of analysis of articles published in Russian-language journals. The direction of network studies in Russia is quite new form of research methodology—however, in recent years we can observe the growing number of scientists working at this direction and institutionalized forms of their cooperation. Studying the structure of these researchers’ community is important for the fields development. This paper is the first report on the research, that is why it focuses on methodological issues. It covers the description of method of citation (reference) analysis that we use and the process of data collection from eLibrary.ru resource, as well as presents some brief overview of collected data (based on analysis of 8 000 papers). It is concluded by representation of future steps of the research. The study has been funded by the Russian Academic Excellence Project ‘5–100’ and RFBR grant 16-29-09583 “Methodology, techniques and tools of recognition and counteraction to organized information campaigns on the Internet”. 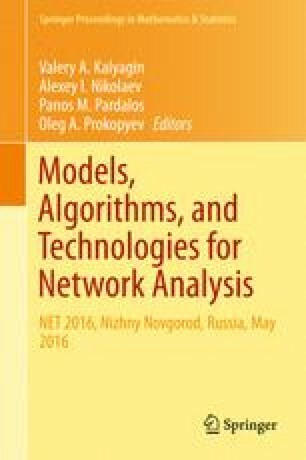 We thank the participants of the Sixth International Conference on Network Analysis NET 2016 and its organizer Laboratory of Algorithms and Technologies for Networks Analysis (LATNA) of National Research University Higher School of Economics (Nizhny Novgorod, Russia) for fruitful discussions and valuable comments on the platform of LATNA Laboratory.